This June, the world’s first and longest man made ice cap glacier ice cave will open in Langjökull glacier, Iceland. The ice cave, or more precisely, tunnel, is 800 metres long and reaches down into the glacier at a depth of 30 metres. Iceland Monitor was invited to see the tunnel before it opens. The ice cave is set to become a "must-see" on any visitor's list to the country. It's located on the vast glacial landscapes of Langjökull where 953 square kilometres of ice strech as far as the eye can see. As you stand on this plateau on top of the glacier some 1,450 m (4,760 ft) above sea level, the ice beneath you is up to 580 m (1,900 ft) thick. To get to the ice cave, you have to drive to the scenic Húsafell in west Iceland, a spot popular with vacationing Icelanders due its location between mountains and glacier which produces a sheltered, woodland environment. From Hotel Húsafell, you will be able to board an impressive 8-wheel-drive glacial super truck, which is quite an experience. This former army truck manages to cross just about anything and the drive through sand, ice and sludge up to the entrance of the Ice Cave takes around half an hour and is a true adventure. On our trip the weather was stunning, with bright sun hitting the sharp whiteness of the glacier and highlighting the jagged peaks of the surrounding mountainrange. According to our driver, sometimes the visibility is close to none on the way up but the truck is so well equipped that it never fails to deliver you safely at the mysterious entrance of the ice tunnel. Once inside the glacier you will see the carved walls of blue ice with a variety of interior chambers that include a small chapel. Once the ice cave is ready in June, it will take you on a journey with interesting information about the glacier, glacial exploration and research and the effects of global warming. LED lit walls inside the tunnel will take you to a variety of chambers containing exhibitions, a café and a room which is available for weddings, parties, meetings and other events. One of the most impressive sights inside the cave is a glacial crevasse, beautiful and awe inspiring with man being a small and insignificant presence in the majesty of of the surrounding nature. Summer 2015 also sees the opening of a new five star hotel, Hótel Húsafell which offers a unique experience of beautiful design, gourmet food and thermal pools to relax in. There are plenty of walking paths in the area with lush scenery to complete your trip to the glacier. 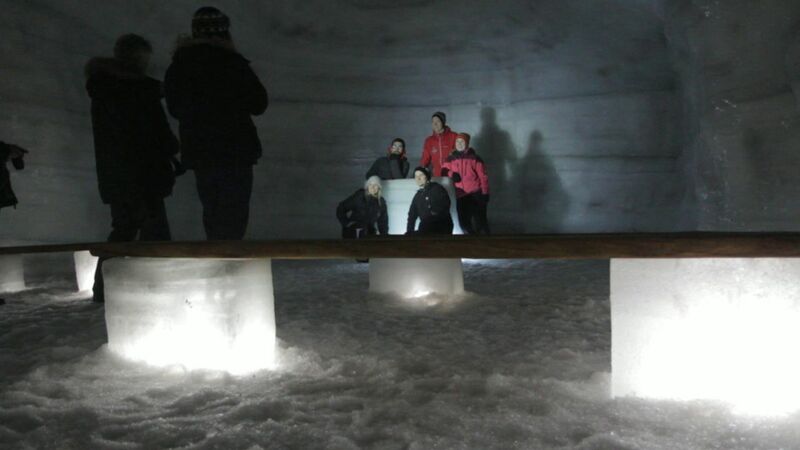 For more information on the ice cave, prices and bookings click HERE. For information about Hótel Húsafell which opens in summer 2015 click HERE.